You saw the pic right before I changed it. XD I think I'll put the pic in an album instead of directly in the forums. That way, if I want, I can just remove it from the album. So, when it's my turn to do the dishes, I listen to music while I wash them because it makes it better that way. Dishes are my least favorite. I have to make it fun, somehow. Recently I've been listening to dance music and, uh...dancing while washing the dishes. I have a grand ol' time. I usually wash them after my parents are asleep, later at night. Tonight, I was just dancin' my heart out, and I do a little side turn for a move, and...my dad had gotten up to use the restroom and saw me. I stopped momentarily...and then went back to dancing. He thought it was funny. I must have been quite a sight, in my messy hair, sweatpants, and house shoes. He later said he was surprised I went back to dancing and that I wasn't too embarrassed. I got no shame. Haha oh no, I shouldn't have uploaded a video of such a good performance.. now when you hear mine it will pale in comparison. I'm working on uploading it but I'm just sort of technologically handicapped. If I ever get it to work I'll share it with you lovely people. Oh, and good job, and stuff. Well played. Now I feel really festive! I want to sleep. I should sleep. But I sleep so much lately staying awake appeals to me. I also want to eat a peach. That sounds pretty good. Can mods be bought off? I read this in another thread that someone had pulled up from 2009. The person is no longer on CC. This cracked me up. seriously its time to auto lock this stuff. I know there were cars in the beginning, why? 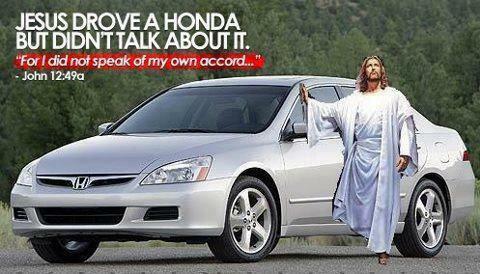 I know it was a Honda accord why? because in the days of Acts he put them all in one Accord. I totally laughed out loud at this. you are appreciated, no matter what you might ever begin to think, in trying to not do what you do not want to do, you are not alone in that at all ever. That is why God came to earth to save us through Son, Christ is your redemption period, trust in that and as make whatever mistakes ask first did "I" harm anyone? God will let you know, as others try to make you guilty, God in you will tell you what is truth or not. I mean Sister they went against Christ did they not? He just likened you to taking acid. Misschris this is just what I see, correct me if I am wrong please? Laughter is very good for one's soul, and a broken Spirit dries up the bones, I choose laughter over broken and you or anyone else? Oh yay. All these old, dead threads brought to the front, pushing a number of active and somewhat interesting threads to the second page to die. Awesome. Thanks to whoever is responsible. Of course... how do you think you become a mod??? You implore them? Implore them to what? I wanna do this song for my other youth group (Y'know, the one where almost everyone talks to me??). It's so pretty. Also...I think maybe I should stop being so hard on myself with what I do. The main thing I can think of is my music. How many times I've criticized myself for not being able to learn certain things right off the bat. New songs, new instruments...I think that's one reason I haven't learned the saxophone. It's not that I can't understand it...I decided I won't understand it, because new concepts I don't get immediately are to be thrown out, and I don't want people hearing my failure. That's not how it's supposed to be, though, is it?